I'm laying here, sprawled out on my bed on this abnormally warm LA evening, feeling overwhelmed and too warm. I thought having a little blog ramble would be therapeutic and help me categorize my thoughts. It's like writing in a public diary; maybe not ideal for everyone, but it works for me. My Blogs: I really am enjoying this little guy and Dreaming in Blush. I missed blogging. There is definitely something different about videos than blogging. I like them both, but they are different. Laura Mercier Almond Coconut Milk Honey Bath: This stuff is so lush. I am in love. Between this and my Laura Mercier Soufflé Body Crème, which I reviewed here, I am addicted to bubble baths again. Plus, the little "honey dipper" thing that comes with it is adorable! I feel like I'm dipping into a bee hive every time I use this, and the jar is too heavy for Pinecone to knock off the counter and break. #Win. Hershey's Cookies N Creme chocolate bar: I never particularly liked or disliked these growing up, but I have become addicted to them recently. If I am in a store and want something sweet, or am picking up snacks for movie night, this is what I've been selecting. Sam texted me last night to ask what I wanted for movie night and my response was "Cookies N Creme and Gatorade!" Oh yes. I am in love with yellow gatorade too. Devious Maids, the TV show. Sometimes when I'm feeling bored I will see what's available for "free download" on iTunes. A lot of times if a show is new, they will offer their pilot episode for free. So I downloaded this one, thinking I had nothing to lose, and put it on the other night while I was cleaning my kitchen. I got totally hooked, guys. It's SO good. It reminds me a bit of Desperate Housewives, oddly enough. If you liked that show (I miss it!!) you should download this pilot and give it a shot. Big Brother: One of my favorite TV shows, and I look forward to this one every summer. It's only 2 episodes in and I know it's going to be a good season. I'm rooting for Elissa a little bit, because as annoying as the rest of the world found Rachel I actually really liked her. I do wish they had brought Britney from seasons 12 and 14 back though, because she was one of my all time favorite players. I miss her commentary! Game of Thrones: I know, what is this? 3 TV picks in one post? Geez! But I had someone insist on getting me hooked on this series, and sure enough, it worked. I'm hooked. I want a dire wolf and a sword named needle. Decorating my condo: Don't get me wrong, I actually really like decorating and organizing, but I feel very overwhelmed with my current condo. It's completely a blank canvas, which sounds way more exciting than it is. I have so many ideas of where I want the decor to go but I'm so freaking indecisive. One day I will be sure that I want one thing, and then the next I'll be feeling completely different. For instance, I saw a picture of a living room with two small tables pushed together to form a coffee table, and I loved it. It felt unique and looked really cool, and I was like, "that's what I'm going to do." Then the next day I see another picture of just one coffee table, and I'm like, "Okay that makes sense. I think one coffee table is more uniform and will be easier to make look neat." The result? I currently have no coffee table at all and am literally using a still-packed "holiday" box as my coffee table. W. T. F. I have issues. Pinecone making a ton of noise at night: I'm not sure I completely noticed the extent of this until last night, when my friend Sam decided to stay the night. She has stayed over before, but this time she came armed with ear plugs in case "the tyrant is loud again". Seriously?! What?! My guests have to bring over EAR PLUGS because my cat is so obnoxious at night!? And to top it off, she brought a pair for me "in case I wanted to try them". And you know what? I loved them. I slept like a baby. They feel weird as heck, but I'm going to try them again tonight. P.S. I honestly think some of Pinecone's "behavioral issues" are because he is deaf. Not because being deaf equals behavioral issues, but because he doesn't know the amount of noise he makes. The little guy thinks he is being sleuth-y, crawling around and howling, when in reality everyone and their mother in a mile radius can hear him. My Diet Coke Detox: It's still going strong, but I am really missing the good ole DC. Sam opened one of my "final 3" this morning and it totally caused a craving to hit. Diet Coke, I miss you. You were one of the loves of my life. The movie "The Call": Watched this last night, and I had the worst anxiety throughout it. Don't get my wrong, I don't mind scary movies, but there was something about this one in particular that really got to me. I don't like the idea of 911 not being able to help you or find you when you are in trouble. On top of that, there is something about abduction that makes me super uncomfortable (more so than torture or anything else that is terrible but common in scary movies). The movie "Beautiful Creatures": Also watched this last night, (we had movie and wine night), and goodness gracious, what a weirdo movie. Did anyone understand this? Anyone who didn't read the book? I was so confused, and not in a good way. We didn't even finish it. My Outs are longer than my Ins, but you know what? That's okay. Sometimes that's life. Until next time, over and out, Captain Crunch. This is not related to this post.. but have you read Beautiful Disaster and Walking Disaster? If not please check them out! Great reads imo! Devious Maids.. I have 2 episodes recorded on my DVR I will have to check it out. Are you still watching PLL? Devious Maids is produced by Mark Cherry who did Desperate Housewives. Eva Longoria is also a producer of the show. I love Big Brother too! I just caught up to the second episode and for some reason I really like Elissa as well. If your sister had already won a season, of course everyone is going to see you as a threat! Any way you should post your thoughts on big brother more often! I am an insomniac like you and I sleep with earplugs and a sleeping mask almost every night. It took me some time to get used to it but now it feels weird to go to bed without them. Being so "shut off" really helps me with calming down and not being distracted by anything. And while I do not have a little tyrant kitty I will soon be moving together with my boyfriend who often seems to be going on exciting adventures in his sleep....at least that's what it sounds like...LOL! Beautiful Creatures is a weirder movie than book. I don't think it translates well and it ends up feeling like Stephen King does Harry Potter. I didn't like any of the characters! I love big brother! Really hoping that they bring back some of the old cast members this season at some point! Love the picture of Pinecone! There were so many things in this post I could totally relate to. I'm also indecisive about decorating. I just can't even pick a color scheme for the kitchen. One day I want cupcakes and pink everywhere, the next day I feel like it should be yellow or lime green to make it cheerful. As a result I have no curtains or a table cloth. Beautiful creatures makes much more sense if you read the book. The movie is actually better than the book which I hardly ever say. Oh, Elle, this blog post is great, I loved reading it. Posts where you are rambling about things that you trouble with and that you like or dislike make you even more pleasant that you already are. Keep going, I love what you do and you are one of the people I most look up to. I read Beautiful Creatures and I found the movie to be weird too! The book is actually really good, but they strayed far from the movie and the way the time passed was portrayed terribly. Don't feel too bad about not finishing it or understanding it. Also, I love both of your blogs! It actually inspired ME to start a blog as well- because you are right, it is therapeutic. Haha Pinecone! He looks like such a crank in that picture. Your blogs are definitely my favorite to read and I love everything that you write!! These ins and outs though are probably my favorite! Also, I am obsessed with big brother too! Who ever could have thought that some like McCrae would get H.O.H. And even though I thought Rachel was a little annoying, I kind of liked her too! And my cat likes to wake up everyone in the house at around 4 in the morning and for the past few days, I haven;t gotten a good sleep but hopefully I can try to zone out his meowing. LOL, Pinecone cracks me up! I definitely think you're right though, if Pinecone could hear the crashes he makes from knocking things over, he'd definitely do it less often. My cats scare themselves when they knock things over, and then run off all paranoid afterwords, haha. I've gotten very lucky with the fact that my cats seem to just sleep with me at night and not stop around meowing, although they do the meow-and-stomp demands all throughout the day. ;P My female cat is doing it right now, actually. Isn't Game of Thrones amazing??? I think it's my second favorite tv show ever, after Lost! If he is able to play whis them I dont have to worry about it. You should definitely read Beautiful Creatures! The novel is amazing and actually makes sense. ;) I agree, the movie doesn't make much sense to anyone who has not read the book. That's disappointing, but trust me the book is worth reading! So glad you are loving blogging. 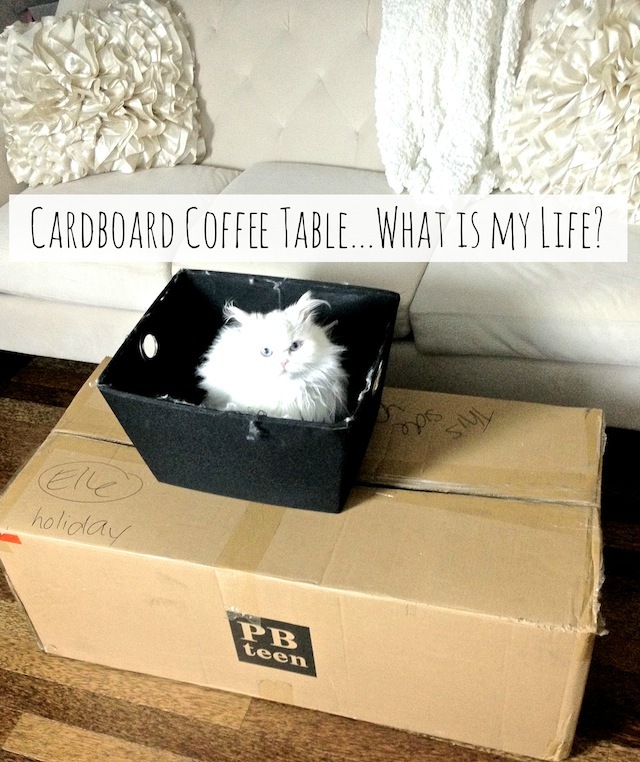 Love that your coffee table is a cardboard box. My nightstand is a trashcan and an Amazon shipping box because I can't decide either. Hi Elle, i've been loving reading all of your new blog entries! I was wondering if you could write a blog post on moving to a different city/living on your own for the first time as an 'adult'. Also, was it hard for you to make friends outside of youtube when you first moved to LA? I want to move to a different city once I graduate college and have been thinking about moving across the country by myself. I am nervous as to how I will make new friends if I move all alone. I love Big Brother! My whole family is obsessed with it, but I am byfar the most obsessed. I follow twitter feeds that give live updates so I don't have to pay for the live feeds and spend all my time watching them. I also adore Britney she has been my favorite, but she is pregnant and due this month so there is no way she could be back in the house. I really love your "in and out" blog posts - I definitely feel like they are more personal than your videos and it is nice to get to know you a little better considering the amount of time I spend keeping up with your life haha. BTW I am obsessed with Mistresses as well, and though he won't admit it, I think I got my boyfriend into it also (SCORE!) Great post as always! Yep. My cat is deaf too and she's such a loud meower! It's easy to get used to when you live with a deaf cat though. I love Big Brother also. I hated Rachel her first season, but liked her when she was on again. I also loved Britney. And I totally voted for Elissa to get MVP because I feel like she will get a lot of slack just because she is Rachel's sister and I want to see what she can do. When my cat was about 20 & went deaf she started to yowl so loudly too! Mainly to say "Where are you?" or "Please come draw me fresh water in the sink" Lol. She really couldn't tell how loud she was being, but you could hear her from anywhere in the house. When you tweeted that a new blog post was up a huge smile was immediately put on my face. I check everyday to see if anything new is up!!!! Oh and also, because of this blog i decided to bite the bullet and make my own! I would love it if you guys checked out my new In's and Out's post from today! I just can't wait to see the rest of your condo. 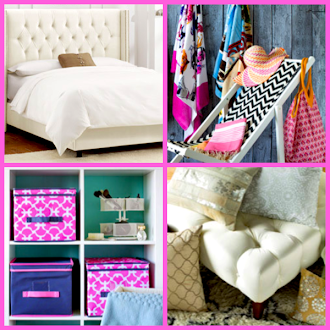 How about show it undone then again when you pick the decor or themes you want later. That would be fun Elle. Aren't you afraid to sleep with earplugs if you can't hear a fire alarm? I've never seen The Call but what you've described as what disturbs you, never see Amber Alert!! Or, do see it if you want to be highly disturbed haha! I love your ins and outs post, I keep thinking I should do them on my blog, but I never do. I always file it away as maybe when your out of ideas, but when I run out of ideas I just don't post for a bit. So terrible. I understand abit about the crazy pet. I'm currently watching my puppy go nuts and chew his toy and it's 2:30 am here. All I want to do is sleep, doesn't he understand it's bedtime? About Beautiful Creatures movie for the record I read the book & saw the movie the two have one thing in common in one word garbage. Can't wait to see the finished condo. I don't love any of the coffee table choices, they don't seem girly enough for you. They had a beautiful big round tufted one with a round silver platter on top on the final episode of this years Design Star (HGTV) that Tiffany put in her room that would be perfect. I dont know where you come up with these little things but keep doing it girl!